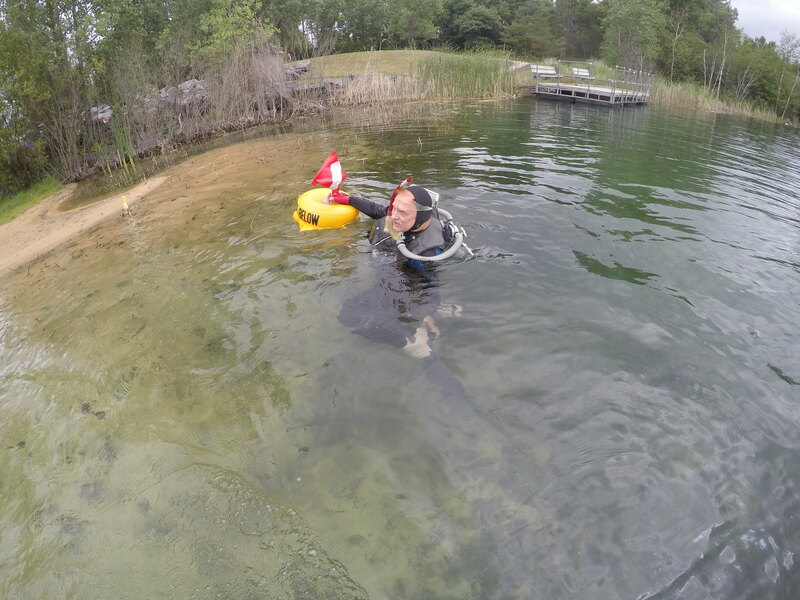 We are having an annual big dive get together at Lake Wayzee where it all started in 2003. Lake Wayzee is in Black river Falls Wisconsin . - As of Monday, there were still rooms available at Comfort Inn and Best Western. - Group Photo is scheduled for Saturday, 11:00 AM at Sherwood Forest access. 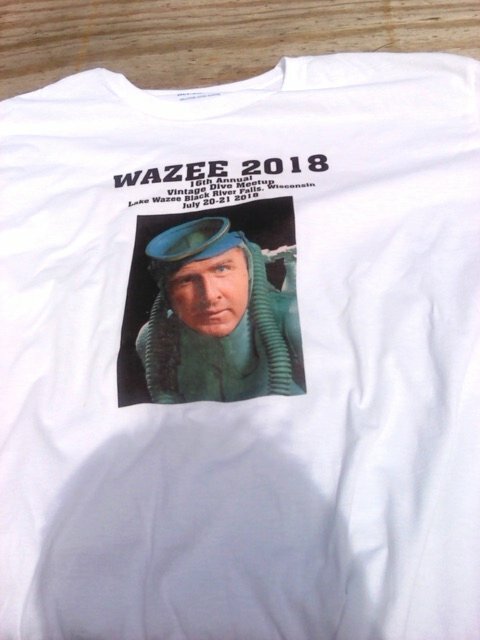 - Wazee Park Fees: $5 per car and $5 per diver per day. 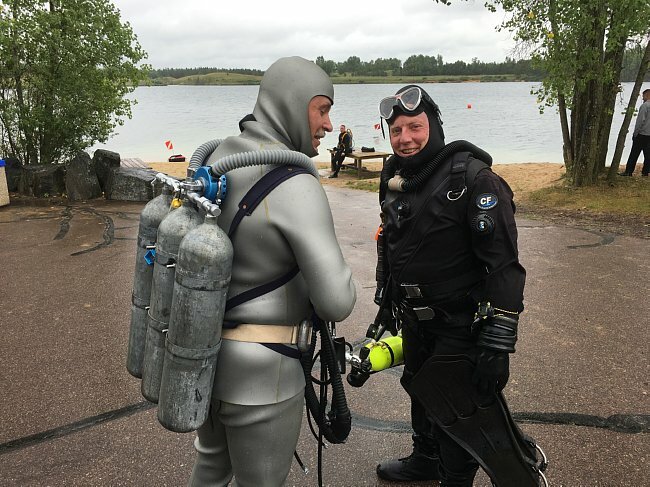 - Sea Hunt Jerry is the organizer of this event and if you're not on his text messaging list, you are missing numerous updates that range from humorous to serious to incomprehensible... But ALL GOOD! The latest examples are messages about a lime green thong, Magnum Ice Cream bars, and a wide open schedule of events... (Meaning lots of unscheduled time for us to dive and visit any way we like). Friday is diving all day and eating at the Pizza Hut Friday night. 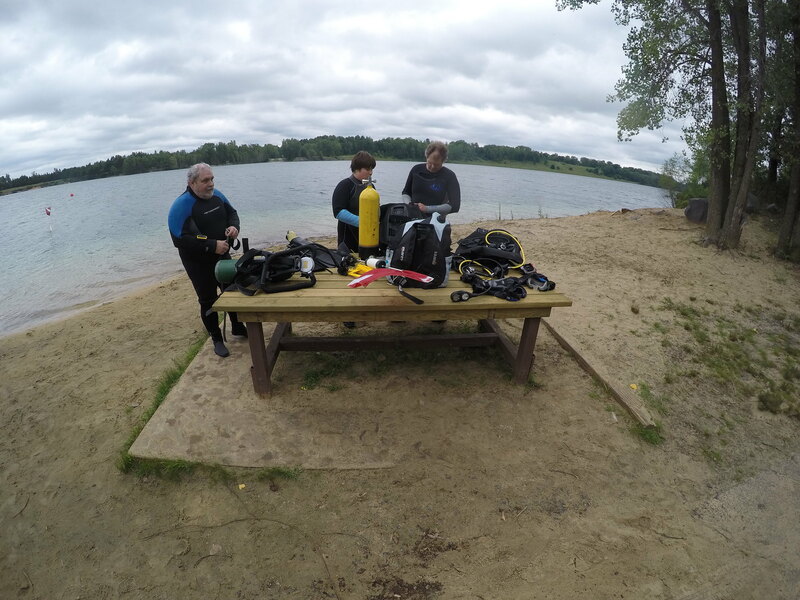 Saturday is diving too, but we want to meet up at Sherwood forest Access at 10:00 and take a group photo at 11:00. I'll have Brats and Buns available for lunch afterward. Feel free to bring something to share and your own beverages. - Jerry mentioned if folks want to bring items to trade or sell, they're welcome. No formalized swap meet, however. 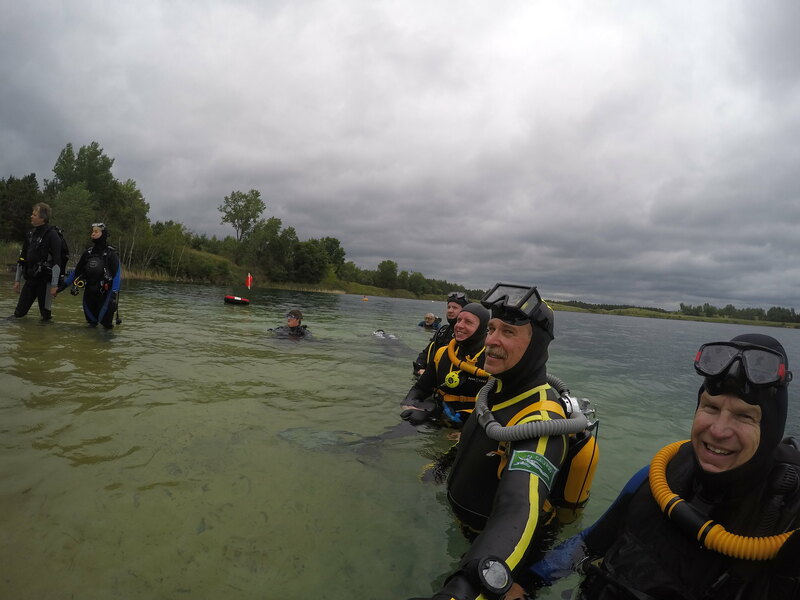 - Our main headquarters will be at the Sherwood Dive Access Point. Look for Jerry's red van, Rons white pickup, or my tan Xterra. - Friday Ron is bringing a triple batch of Sloppy Joes for lunch. - Saturday I'll have Brats and buns for lunch. - Feel free to bring something (potato salad, cole slaw, cookies, bars, etc.) Hungry divers will appreciate it! - I think they are actually lower than previous years. - Plus $5 per diver. - Best to have cash for this. I have paid by check when self registering with the envelope in the box. But there is likely to be a park official at the booth this time of year and having cash may avoid any issues with them not accepting a check or c-card. - This will be my last update for this event... Hope to see you soon at Wazee! 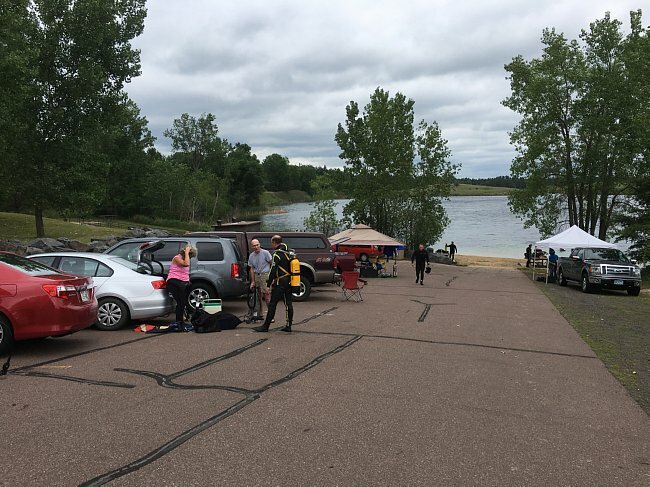 Hi We had the Largest attendance ever Friday 19 divers and Saturday 23 .Thus making this the Largest attended Vintage Double hose event at Lake Wazee . Water was clear and warm lots of good dives,friendship and food! - To start with, the weather started out terrible and the forecast was more of the same. Frankly, I thought we'd get a terrible turnout. We even stopped along the way to eat a nice breakfast... Thinking it would be pouring rain all day anyway. So, we arrived at the Wazee parking lot a little late and were surprised to find it was FULL. Below you can see Ron Bentz in the yellow striped wetsuit visiting with the Stiers. - A HUGE THANK YOU is owed to Ron Bentz. He got there a day early and set up his huge awning. A generator was quietly humming with electricity to heat up the "Triple Batch" of Sloppy Joes he brought along. He was even filling tanks. Ron's set up made a great place to step out of the drizzle. 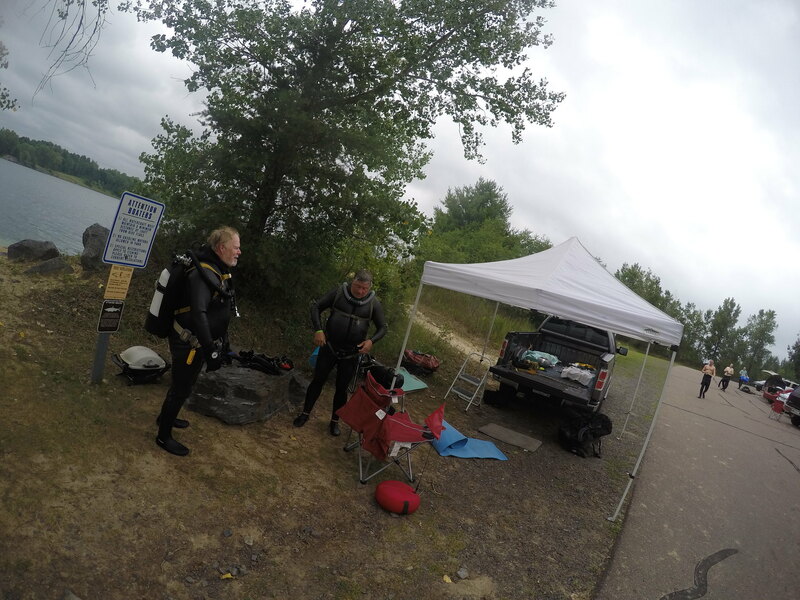 Thanks also to the divers who brought the delicious salads, chips, cookies and desert bars we ate with our Sloppy Joes. 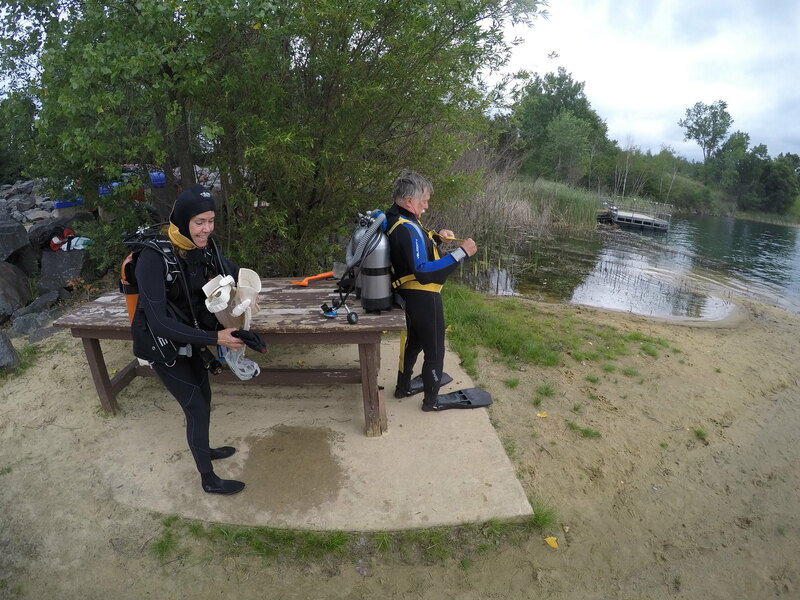 - We had a mix of familiar faces and others who came to see what vintage diving is all about. Below is a young family of 3 on the left and then Dave Kraft, Tom McClusky, Drew's friend, Drew, Ron, and Drew's Dad Bill. - Snark IIIs are getting popular. 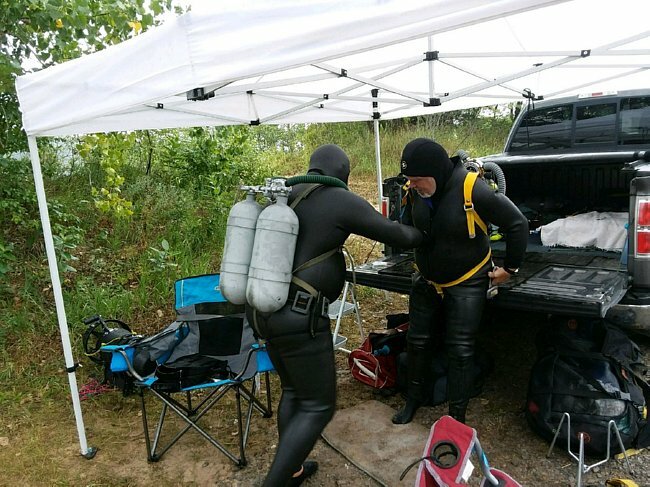 Below are Rich and I suiting up for our Snark III Theme Dive. Me with my restored V2 Snark III and Rich with his converted fireman's Snark-A-Master. Tom showed us his Snark III with hoses positioned laterally. And Ron dove his Snark , too. - Vintage versus Vintage/Modern... You saw it all at Wazee. 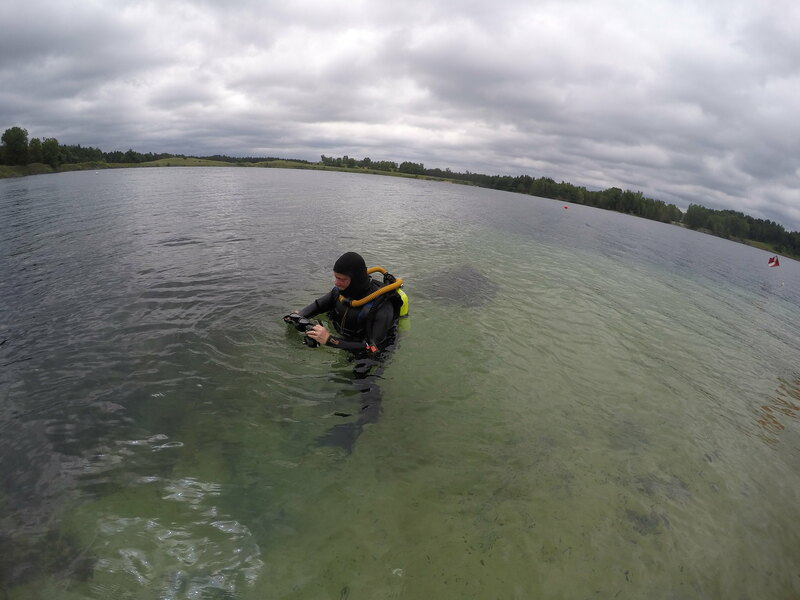 Here is Ron sporting some beautiful triple tanks, Voit 50 Fathom double hose regulator, and silver wetsuit... 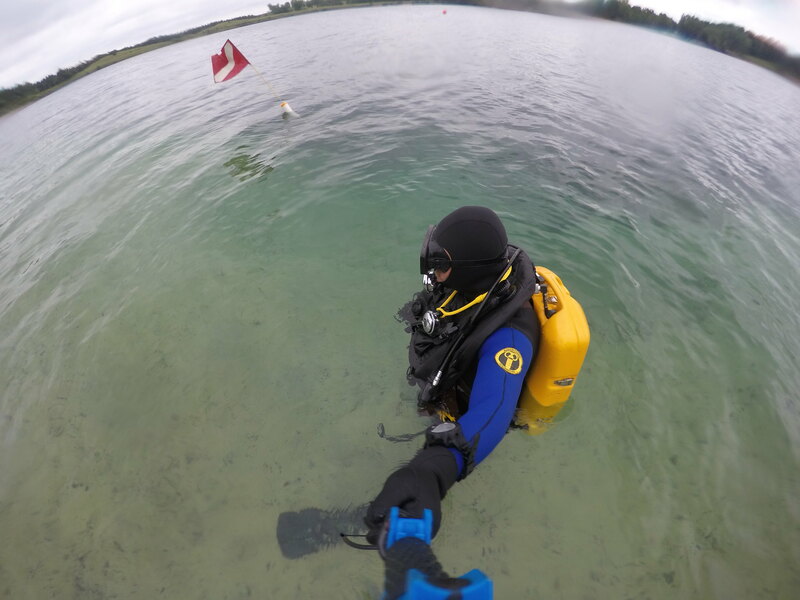 Contrasted with SwimJim in a modern Tech Diver dry suit with bail-out bottle... And fitted with a DIVAIR reg, Hope-Page mouthpiece, and steel tank with VDH plate. - The second day dawned absolutely beautiful. Bright sunny day. 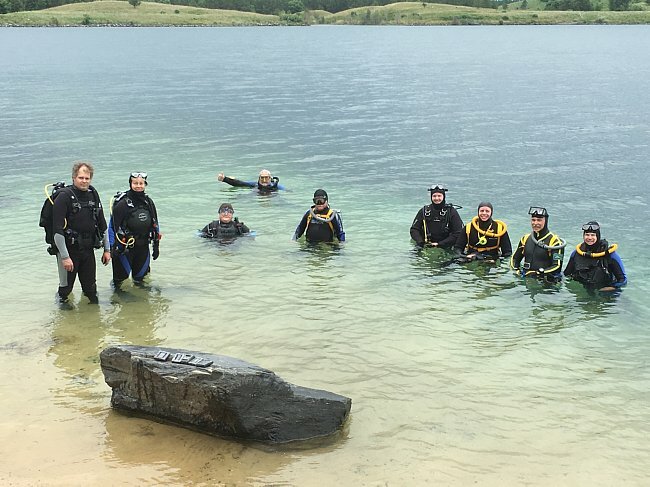 We did some diving at a different park location and lost rack of the time. So, we ended up arriving about 10 minutes late for the group photo. 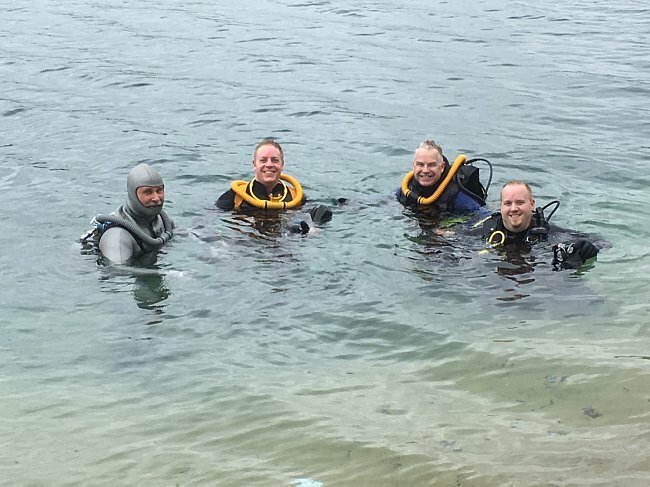 I wanted some photos of my regular dive buddies and so we managed to snap this one (below) of Nanette, Tom, me, Rich and SwimJim. It sure was nice diving and visiting with these buddies. - I got another good "Buddy Shot" (below) of Ron, Drew, Bill, and their friend. I have dived with these guys several times now. - And In addition to everything else, Ron took a pile of photos and videos... Above and below the surface. He got photos of himself in each of several vintage themes: Sea Hunt, JAWS (movie), UDS-1, Traditional vintage yellow tank, yellow stripes, get up, and more. 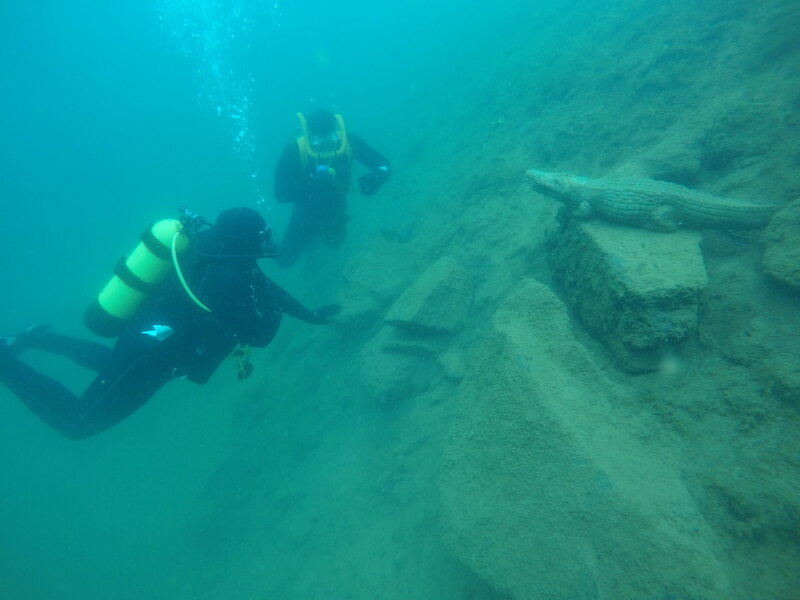 He got photos at all of the underwater attractions... The shark, lion, pirate, sunken boat, etc. He sent them all to me to edit and post but I have to apologize it is just too much. I think it should go in a drop box or something. - Wrap Up... As hoped, we all had a great time diving and visiting about our vintage diving gear.